Bidding ends: Wednesday, March 6, 2019. Lots start closing in one minute intervals at 7:00 p.m. Eastern time. Inspection: Tuesday, March 5th, from 10:00 a.m. until 6:00 p.m.. IMPORTANT: Buyer's must travel to the auction site to make payment in person and provide their own labor and equipment to remove their items on Thursday or Friday between 9:00 a.m. and 5:00 p.m. or on Saturday between 10:00 a.m. and 1:00 p.m. Eastern Time. Click here to watch a video about this auction on youtube. LOCAL PAYMENT and PICK UP ONLY! Auctioneer WILL NOT load, package or ship any item. Buyer must travel to the auction site to make payment in person and remove their items. PAYMENT: Accepted forms of payment for this auction are CASH, CREDIT CARD, CASHIER's CHECK or WIRE TRANSFER. Payment is due at time of sale. Cash, Credit Cards and Cashier's Checks must be hand carried to the auction site NO LATER than 1:00 pm Saturday, March 9, 2019. Wire Transfer payments must post to our account no later than 4:00 p.m. Friday, March 8, 2019. Auctioneer reserves the right to resell, without notice, any items for which payment has not been received by the deadline. Buyer may be held responsible for any shortfall. 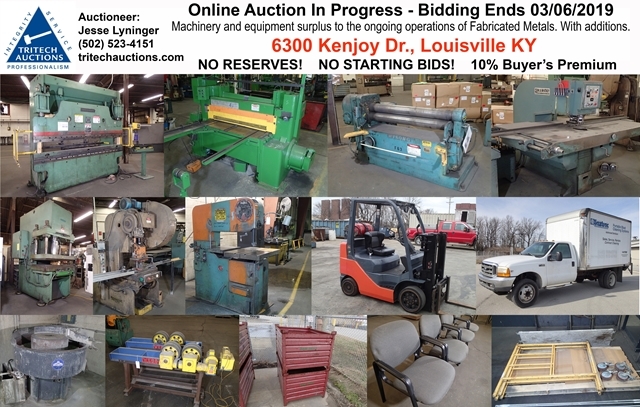 REMOVAL: The auction site will be open for payment and removal on Thursday March 7th and Friday March 8th from 9:00 am until 5:00 p.m. and on Saturday, March 9th from 10:00 a.m. until 1:00 p.m..
Additional removal time for major machinery (Lots 3 thru 18) may be granted at the sole discretion of the auctioneer. Any questions concerning removal deadlines should be addressed prior to bidding. Regardless of when the items are to be removed, payment must be made in accordance with the terms listed above. The auction company reserves the right to confirm payment prior to releasing items. Any items not removed according to terms will incur removal and storage fees. SALES TAX: Kentucky Sales Tax of 6% will be applied to all items as required by law. DEALERS purchasing for RESALE must provide a copy of their KY Sales And Use Tax Permit, or their states equivalent, along with a completed and signed Kentucky Resale Certificate form number 51A105. Items will not be released until this requirement has been met or the tax has been paid. No other forms of sales tax exemption will be accepted at this auction. Bidders with any questions concerning the application of sales tax should call the auctioneer at (502) 523-4151 prior to bidding. The auction company may contact the Kentucky Department of Revenue to confirm the validity of any tax exemptions claimed by Bidders. Buyer assumes all responsibility and risk for items they have purchased at time of sale and must provide their own labor and equipment for moving and loading or contract with an appropriate third party. All items must be removed in a workman like manner. Buyer will be held responsible for any damage to the property caused by Buyer or Buyer’s agents. 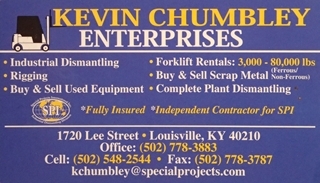 Kevin Chumbley Enterprises has been pre-approved to provide rigging services at this auction. For estimates on rigging costs, call Kevin at (502) 778-3883.